Allyson Tintiangco-Cubales is a Professor of Asian American Studies at San Francisco State University, where she also serves as an affiliated faculty member in the doctorate program for Educational Leadership and the coordinator for the Master’s Program in Asian American Studies. Tintiangco-Cubales earned her Ph.D. in Education from UCLA and B.A. from UC Berkeley in Ethnic Studies. She serves as the Co-Founder and Director of Culturally and Community Responsive Curriculum Development and Teacher Training for the Institute for Sustainable Economic, Educational, and Environmental Design (I-SEEED) and is the Founder and Director of Pin@y Educational partnerships (PEP), an ethnic studies educational pipeline that creates partnerships and projects that work toward social justice. Her research interests are in urban youth, community studies, critical performance pedagogy, motherscholaring, and Pinayism. She has published several books and an array of articles focused on the development of ethnic studies curriculum and community responsive pedagogy. Colin Masashi Ehara is a Yonsei-Nikkei/Celtic/Haudenosaunee heritage English and Ethnic Studies Educator, teaching in his hometown of Richmond, CA, at Aspire Richmond Cal Prep (6-12). He received a BA in American Studies from UCSC, an MA in Asian American Studies from SFSU, an MA in Teaching with a concentration in Urban Education and Social Justice from USF, and HELLA student loan debt from the federal government. Over the last 15 years Colin has worked as a Basketball Coach, After School Program Director, Case Manager, Educational Researcher, and now classroom Teacher, in Richmond, San Francisco, San Rafael, Berkeley, and East Oakland. He gravitates towards those who can quote Kendrick Lamar, E-40, Arundhati Roy, The Simpsons, and/or Paulo Freire, and is a core member of People’s Education Movement Bay Area—a collective of Educator-Organizers of Color who work towards developing decolonial, humanizing, pro-people pedagogy and praxis. Colin and his wife/partner, Emalyn reside with their 9 month old daughter, Aya in El Cerrito. One of the most important things we can do as a form of self-care and improve overall health is to be physically active. In this workshop, Davd will cover self myofascial release to help relieve pain commonly associated with a sedentary lifestyle as well as the framework to improve posture and movement to prevent injuries. Although this field of understanding fascia and movement is still developing, there are basic things about the human body we need to understand that should be taught in schools, but aren’t. This workshop is what all of us need to know to potentially save money and become less dependent on our broken health care system. This workshop engages in the practices of culturally relevant pedagogy. By using lowriding and its elements, participants will explore various ways to connect with students by stretching beyond the parameters of comfort. +JJohn Ulloa is a professor of history and cultural anthropology, and Honors Transfer Program Coordinator at Skyline College. He has conducted participant observation fieldwork throughout California, Japan, and Brazil for his forthcoming publication on the globalization of lowriding. He presented at RTSB 11, where he was also the recipient of the RTSB faculty award. +Deaidre White is an award winning, Bay Area born and raised, spoken word artist and educator. She is the curator of Where The Magic Happens ( a monthly open mic) and the future host of Cuts and Line (a barbershop poetry experience debuting in 2019). When not on stage, Deaidre can be found inside of a middle school class teaching creative writing and/or fostering youth as a middle school coordinator for the Boys and Girls Clubs of San Francisco. This interactive workshop will explore the elements of hip-hop and Ethnic Studies through the use of cultural energizers aka THE GET DOWN. This will be an opportunity for educators to share best pedagogical practices, create new activities that culturally engage your students, and critically reflect on our respective pedagogies. +Andres Rodriguez is a Professor of Ethnic Studies at San Jose City College. He is also part of Low End Theory Collaborative, a Sacramento-based non-profit organization that provides hip-hop-based educational programming for students and educators that includes Rock The School Bells Sacramento conference. Andres has been part of RTSB for a number of years now as a participant and workshop facilitator. For Andres, the theme "Heart and Soul" means critical reflection, honoring those who came before you, and paving new roads for the future generations. +Dr. Cindy Huynh is a Professor of Ethnic Studies at San Jose city College, and was the keynote speaker for RTSB 11’s Educators Conference, Re://Fresh. Prior to teaching at SJCC, Cindy also taught at Evergreen Valley College in Ethnic Studies, San Francisco State University in Race and Resistance Studies, and the University of Utah in Education and Gender Studies. Cindy volunteered at a Rock the School Bells many years ago and made her way back for RTSB 11, when she was asked to bless the mic as the keynote for the Educators’ Conference. Cindy believes in RTSB because it is a beautiful example of praxis. To provide deeper insight into the Hip-Hop culture and its elements by sharing its history. In order to know where Hip-Hop culture can go, you first need to learn about where it all began and who its architects are. The workshop/lecture seeks to provide educators with a higher level of understanding of a culture they are already familiar with. Steve “Zulu Gremlin” Roybal shares four decades of Hip-Hop culture and its 360 degrees of knowledge, wisdom, and understanding. The XL 2019 program includes history and insight of each respective element and both male and female contributions to a subculture-turn-pop phenomenon. Expand your culturally relevant teaching repertoire by learning about hip hop pedagogy (HHP) as a means to create more active engagement that reflects your students' culture, interests, and realities. Utilizing the theme of the conference, hear from instructors who will conduct a lyrical analysis lesson and create an artistic mixtape project. Connect with other folx and come away with thought provoking activities for your classroom. +Chesa Caparas, Tony Santa Ana, & Felipe Ponce are instructors at De Anza College. Tony Santa Ana brought RTSB to De Anza College from the jump (3 years strong) and Chesa Caparas has helped organize the last two RTSB conferences at De Anza. 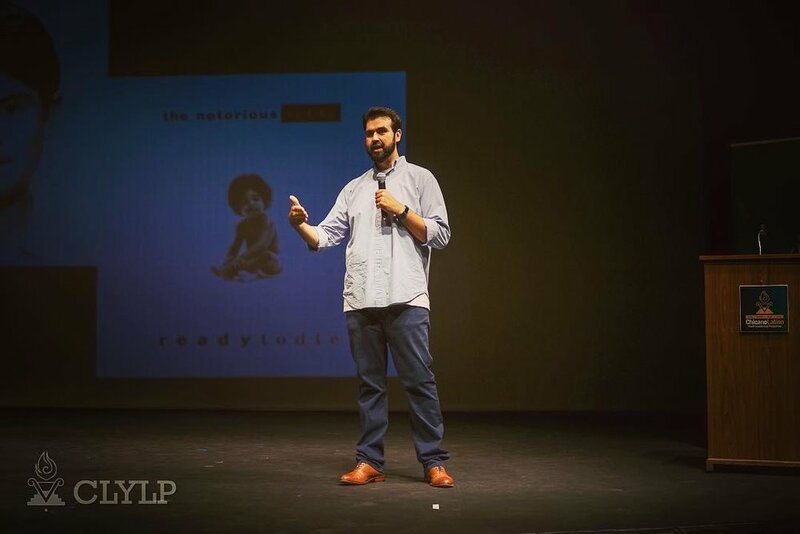 Felipe Ponce has been utilizing Hip Hop Pedagogy in the classroom as the core values of his pedagogy since he started teaching in higher education. The theme heart and soul means that we engage in the deep intersections of our community and how Hip Hop is our healing medicine for our resilient lives. Just recently, these three instructors presented a Hip Hop Pedagogy workshop at De Anza College for students and faculty. Social justice counseling is regarded as “a multifaceted approach in which counselors strive to simultaneously promote human development and the common good through addressing challenges related to both individual and distributive justice” (Crethar and Ratts, 2008). Hip hop therapy has been used by psychologists and counselors to engage clients in treatment regarding mental health. Rap artists have been increasingly using their platforms to discuss not only their experiences with mental health, but also racial, economic, and social inequality through their music. The intention of this workshop is to introduce a multicultural, creative counseling intervention or tool for educators, mentors, and youth development professionals that uses rap music to assist with developing programming that encourages equity, justice, and activism at the micro level. +Carmen Towler currently serves as a Retention Specialist at Sonoma State University, providing programmatic and individual support of students on academic probation. She developed a passion for hip hop in childhood, and continuously sought opportunities to incorporate it into her academic and professional career. Carmen performed research on the evolving history of hip hop culture throughout high school and college, and graduated with a Bachelor of Arts in History from UCLA. Both inspired and hurt by her knowledge of the achievement gap, she returned to school to pursue a Master of Arts in Guidance and Counseling from Loyola Marymount University to achieve a career in academic counseling. Wanting to inspire other educators to use hip hop with their clients and students, Carmen has presented her research on Hip Hop Therapy at Loyola Marymount University, the California Counseling Association, and UC Riverside. This workshop will introduce the Today's Future Sound Therapeutic Beat Making (TBM) model as well as the TFS Beats Pedagogy and educational applications. Participants will learn about the different between PTSD and Complex/Developmental Trauma, how this affects students capacity to learn, how the TBM model addresses trauma and can be used to deliver content as well as illustrate Math, Science and other subject matter concepts. Additionally, participants will learn the basics of beat making and about free and cheap applications for computers, smart phones and tablets. +Dr. Elliot Gann is Director of Today's Future Sound (TFS), and Marlon "Unlearn the World" Richardson and Elwin "DaRapNerd" Williams are both senior instructors at TFS. Marlon Richardson is also Director of Education at Hip Hop for Change. All three have a strong commitment to youth development, social justice and healing. Heart and Soul means compassion, strength, empathy, connection, community and healing. TFS has had the honor of presenting and delivering workshops for the past six years at RTSB, and is the recipient of a RTSB Legacy Award. This interactive workshop will introduce participants to culturally responsive education with an emphasis on Hip-Hop culture. Presenters will review four pillars of culturally responsive education, and explore how various tools in Hip-Hop culture can help sustain this practice. Most importantly, as we discuss the power of this student-centered approach, we will intentionally reflect on the power of self-reflection and healing in order to grow as enriched educators. Therefore, this presentation will critique the idea of balance (between work and life) and prompt participants to move towards a sort of harmony that unifies reflection, service, healing, and love. +Jesus Limon is a Professor of English at Sacramento City College and an English Lecturer at Sacramento State University. Though born in Guadalajara (Mexico), he grew up in the diverse community of South Sacramento. He proudly serves his community by organizing spaces (like RTSB, Sac) where students can learn about higher education and personal empowerment through art, culture, and social justice. As a proud participant of RSTB for the last six years, Heart and Soul captures the commitment to love we share collectively, as expressed through Hip-Hop education and culture.